Mom guilt. It’s an ugly phrase, right? I’ll be the first to admit that parenting under the microscope of social media where everyone has an opinion – whether their children are real or proverbial – often makes parenting much harder than it should be. The struggle is MORE than real to strike that balance between trusting our gut and weathering the two-cents of “the village”. 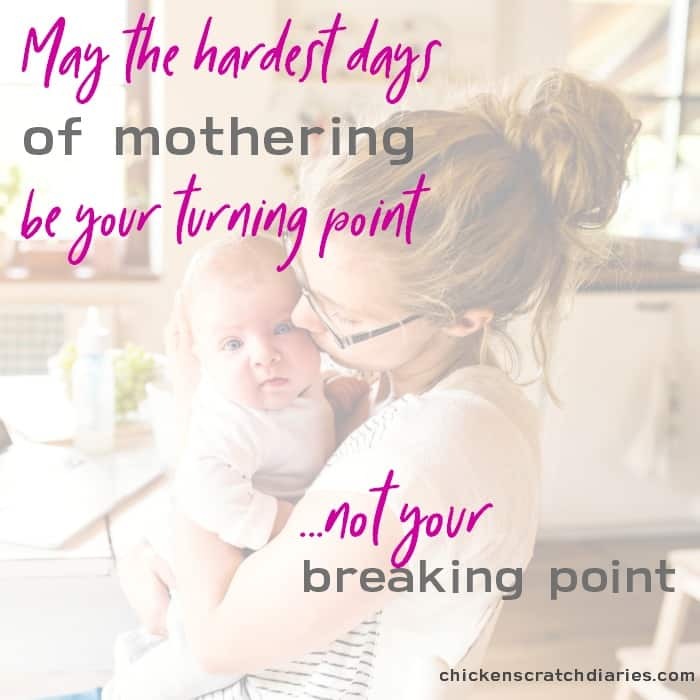 And just when we think we have it figured out, that feeling creeps in that we’re not doing enough for our kids, or that we should be doing something entirely different in regards to our parenting and lifestyle choices. In conversations with friends and in just about any group of moms, the topic of mom guilt inevitably rears its ugly head, in its many shapes and forms. We want to know how to let go of the guilt; how to feel better about our crazy, chaotic role of mom-plus-everything-else, and we want an easy three-step plan to tackle it. So what’s the REAL origin of the “mom guilt” and once we understand it, can it ever be constructive? Before you come at me with all the pitchforks, let’s dissect this thing a little further. First, maybe we should come up with a definition for the “mom guilt”. So, with this newly defined term, IS IT really guilt? To me, guilt implies you believe you’ve deliberately done something wrong. And we all know that doing things not involving our children are, well, often necessary and indeed, not wrong. 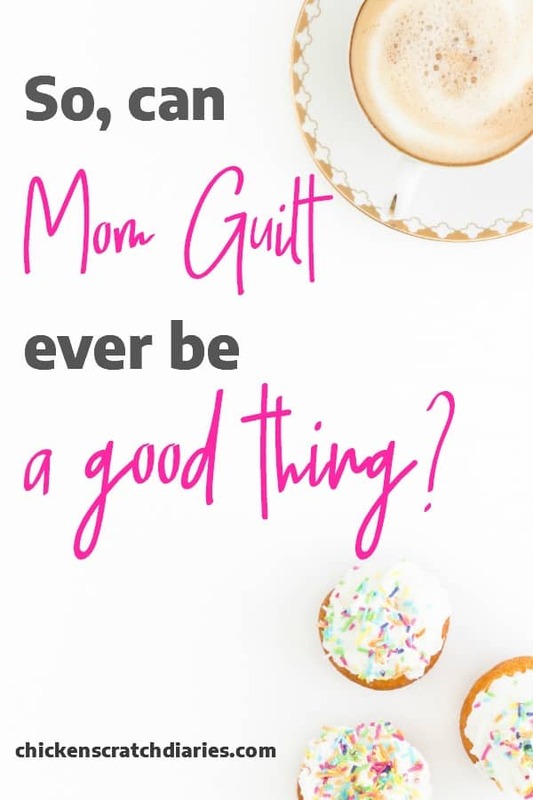 Personally, there are times I feel this “guilt” when I’m with my children while working at home, when I’m at the office, at the grocery store and even when I’m paying bills and doing chores. It seems like there’s never enough time with the kids, or at least never enough intentional time to soak in their childhood. So what do we do? When is the “guilt” completely unwarranted, if at all, and when is it ever productive? Why do we feel bad about doing anything else besides mothering during our waking hours? I think a lot of our conflict goes back to, again, the crazy unbalanced schedules most of us moms attempt to juggle. And honestly, I don’t believe that a perfect balance exists. It simply isn’t possible in the current economical climate of most homes. For most families, two incomes are a necessity for survival. The industrial revolution ushered in a new age of convenience in the 1950s at the same time that many women HAD to find work post-World War II. But sadly (in my opinion), it’s been nearly impossible for most moms to opt-out of the workforce since then. I do believe living on one income is possible, but it takes a lot of sacrifice, of which both Mom and Dad have to be willing to agree upon. 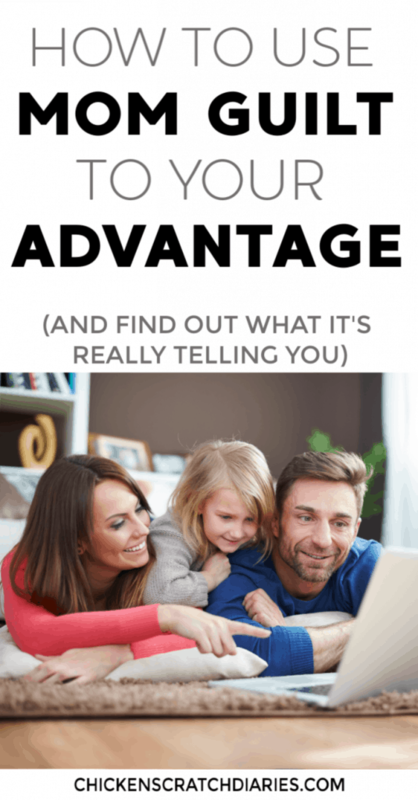 And it usually takes a lot of planning prior to kids entering the picture – making smart choices in savings, spending and career choices that align with that goal. So in my view, working outside the home probably tops the list of things that cause mom guilt. This is easy to understand, because being away from home several hours a day simply gives us less time with our kids to start with, and the time we do have left has to compete with other tasks that need our attention at home. Even if Dad shares some of those duties, statistics show that the majority of household tasks still fall on the working mom. We certainly, as mothers, carry the mental load of all.the.things despite the physical participation of Dad. 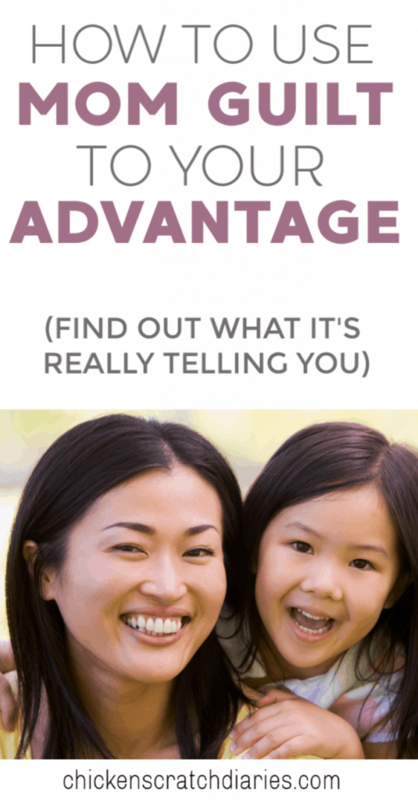 The combination of these factors makes it easy to see why moms feel guilty for doing any small thing for themselves outside of work or household tasks, when whatever time we do have left in our day is slim to none. Given all of this, I don’t find it surprising that even with the push towards workplace equality over the last few decades – the majority of working moms report they’d rather be at home, if given the choice. If only it were feasible. So back to our original question: Is it ever appropriate to feel this guilt, no matter its origin? Clearly, there are circumstances we can’t control that often dictate these feelings, so why does it even persist? Why are we even still talking about it? 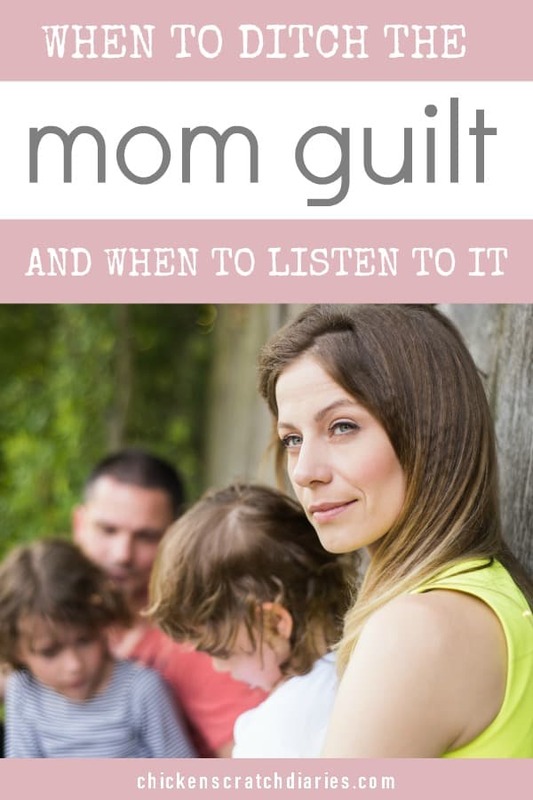 The answer to mom guilt? Believe it or not, I think there is an appropriate time to evaluate these feelings more closely and figure out if it’s really an unnecessary burden we’re placing on ourselves – or if we should listen to it. In most of the responses I’ve read attempting to solve this dilemma, the answer goes something like this: Just ditch the guilt! Stop feeling bad! All you need is more self care! You rock! And, I get the need for positive affirmations. We can certainly use all the encouragement that can be found in this weary stage of life. Let me be clear: guilt for the sake of guilt is never constructive. As a Christian mom, I truly believe that there is no condemnation in Christ, and we don’t need to bear the weight of sin that Christ has already forgiven. But I’m not really referring to sin here. What I’m talking about is this feeling of unrest and uncertainty that sometimes plagues us in the most mundane moments and makes us question everything we’re doing. You know, the feeling that we’re missing something – that there’s a better way, an imperfect-yet-better-balance that could be found, if the world would stop spinning long enough for us to place our finger on it. So in this context, what I really want to ask is this: What if the mom guilt is not because of something we’ve necessarily done wrong, but more of a vague unease or sadness we experience that has a valid root? What if this unease that we’ve dubbed mom guilt can even be constructive and bring about positive, necessary change in some instances? What if we made a career change that allowed for more flexibility? If we MUST work, and the unease doesn’t fade — is there a better option to explore? What if we decided to schedule our social media time to ten minutes per day so that we can get lost in our toddler’s laughter instead of lost on Facebook for an hour each evening? What if we went to counseling, found a way to communicate with our spouse about our need for sharing household duties – a catalyst for positive change all around? What if we considered these feelings as another God-given intuition falling right into line with our nurturing ability? What if these feelings sometimes surface to protect the fragile harmony we never knew was possible in our home? I have to ask these questions because, in a world where I’m told I shouldn’t feel guilty about anything, I know better. And it’s ok to dig a little deeper into these feelings. I believe that if we let it, this guilt/unease/unrest can challenge us to seek God’s best plans for our life, and our kids’. And when we do that – when we know our steps are measured with intent, we can live more joyfully and parent with confidence! It’s just up to us to decide how willing we are to ignore the status quo and sometimes even instigate some radical changes, IF they are deemed necessary. So every now and then, I think it’s ok to stop. To listen. To let go of the things that are clearly beyond our control. To consider what things we might have more control over than we realize. Because really, the only thing we have to lose is the guilt.